• to determine risk mitigation actions to keep the fleet working in service. • to develop a long term 'safe-life' solution. Within hours we began to gain an understanding of the problem using a simple finite element model. This showed that the bracket was particularly susceptible to lateral loading. We gained enough understanding of the bracket fatigue prone areas to position number of strain gauges for an investigative on track test. The test train was taken onto the track in a number of configurations (cardan shaft attached, removed and freewheeling). 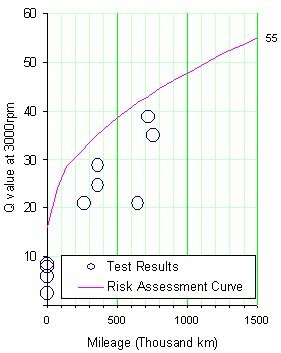 This would help us determine the relative magnitudes of possible fatigue mechanisms. A spotlight was quickly thrown on the importance of low magnitude but high frequency stresses arising from cardan shaft's out of balance forces. This problem could only get worse with time as the cardan shaft wears. understand the most important fatigue driving mechanisms. understand the importance of cardan shaft loading and the dynamic response of the motor on its resilient rubber mounts. determine stress signals for input to crack growth models. This forms the basis of an inspection regime to guarantee passenger safety. redefine new loadcases to develop a long term solution. Until a long term solution could be devised and implemented it was necessary to undertake risk mitigation actions to ensure the the fleet was running without any risk to passengers safety. This was possible by establishing a crack inspection regime. Ultra-sound Inspection trials were set up to determine the minimum detectable crack size. Simultaneously, using samples of stress measured during the on-track testing and incorporating stress factor to account for cardan shaft ageing, it was possible to calculate an inspection interval to guarantee detection of a crack before a bracket failure. it removes weld toe material (this is inherently poor quality material with many defects and flaws that make it susceptible to fatigue failures). it repositions the maximum stress away from poor quality weld material and into good quality polished parent material. Thus the initiation of crack growth was less likely. it increases inspectability of the bracket (smaller cracks could be reliably detected thus cracks can be repaired sooner and the safety of the fleet is increased). It was difficult explaining that removal of material from a critical section would result in a fatigue strength improvement but the method was endorsed by supporting finite element analysis and expert papers. The detail was easily and quickly introduced by a drilling and polishing operation. 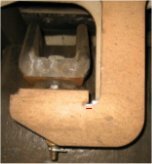 Joints in the cardan shaft wear with time and increase the amount of out of balance force acting on the traction motor mounting brackets. Our analysis and calculations showed that we needed to decrease the inspection interval to accounted for an ever increasingly aggressive fatigue environment. It was important to monitor the cardan shaft loading by continuous testing of cardan shafts on a balancing machine. The problem was exacerbated when a new risk due to heat damaged rubber motor mounts was identified. Additional stress factors were introduced to account for the new risk and the inspection period was reduced accordingly. Over the monitoring period the inspection regime managed to find a number of cracks which were safely repaired before they became anywhere close to the critical size for fracture of the bracket. A non-linear dynamic model was developed by a partner in Switzerland to study the dynamic behaviour of the traction motor on its resilient mounts excited by the cardan shaft out of balance forces from 0 to 200kmph. Low speed pitching mode gives peak vertical loading on the motor mounting brackets. 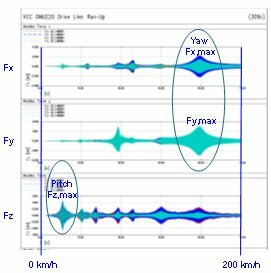 High speed yaw mode gives peak longitudinal and lateral loading. All modes of vibration are evident in the plot of bracket forces verses speed. It is notoriously difficult to interpret the results of dynamic analysis and define loadcases for a finite element stress model. The initial approach was to take the maximum loads in each direction and apply them in the most adverse combination. This proved to be too conservative and an alternative approach was developed. It was possible to determine stress time histories at fatigue critical locations using dynamic model output. Damage could then be calculated using rain flow counting methods. Once the approach was developed, design iteration which included the rubber mount manufacturer allowed us to optimise the stiffness and damping characteristics of a new high temperature motor mount. This was to become an important part of the solution. New 'riveted in' reinforced front brackets. Structural enhancements including TIG dressing of weld toes and profiling plates to introduce softener details at weld ends. Inclusion of a dynamically optimised high temperature motor mount. Cardan shafts monitoring and control system. The solution was developed using predictive analysis techniques and validated by monitoring critical strain gauge locations over some 20,000km. In addition the predicted benefit of a new high temperature rubber motor mount was also supported by on track testing. The final solution has an unmonitored safe life of 30 years.